Imagine you have just awakened into an unknown place, surrounded by strangers. Terror resides in you even though the circumstances seem un-threatening. Nightmares invade even your slumber. This is Morgan's plight! 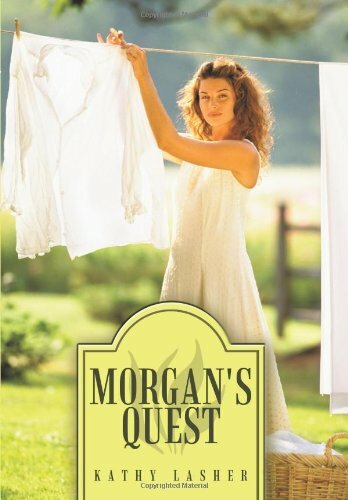 Falling form her horse, Morgan wakes to find herself with out identity. Forced to trust in strangers who seem to become her friends; but, somewhere out there danger lurks. Who or what can be trusted? Who can she be? What past dogs her footsteps? Caring new friends encourage her to look to God for comfort and help, but Morgan is angry at a God she is not even sure exists. To make matters worse, Morgan is ill. Suddenly, a face in the crowd strikes a recognizing chord within; and fearfully, Morgan flees into the midst of a blizzard. Aided by a handsome drifter, she makes her escape. But can she really trust him? Trampas is a tortured young man who has lost house and family in a raging fire. He, too, is running from a past. Drifting from town to town he meets a beautiful, mysterious woman in serious trouble. He is in a perfect position to help her; but, will the morbid memories let him? Someone is burning down the homesteads in the area. The search is on to find the culprit and bring him to justice. Then the destruction turns personal. You'll not be able to put down this delightful love story that takes place in an old mining town in Colorado during the post Civil war era. The tapestry of interwoven lives unfolds beautifully in this suspenseful, romantic tale. Kathy Lasher grew up in Alaska in a family of eight on the Kenai Peninsula. During the cold snowy nights the family would gather around and listen while her mom would read one adventure after another. Now as a mother of two she loves to spin her own tales that keep her children wanting more. Growing up in the back woods, Kathy enjoyed riding horses, dog sledding and commercial fishing with her family. As a young woman she attended Bible College in Washington State where she met her husband and obtained a Bachelors of Theology, shortly after that she followed with an R.N. Degree. Today she is a stay at home mom who in her spare time loves to participate in prison ministries, youth groups, worship teams, and visiting the homeless on the streets, occasionally she gets the opportunity to join in with a missionary trip.